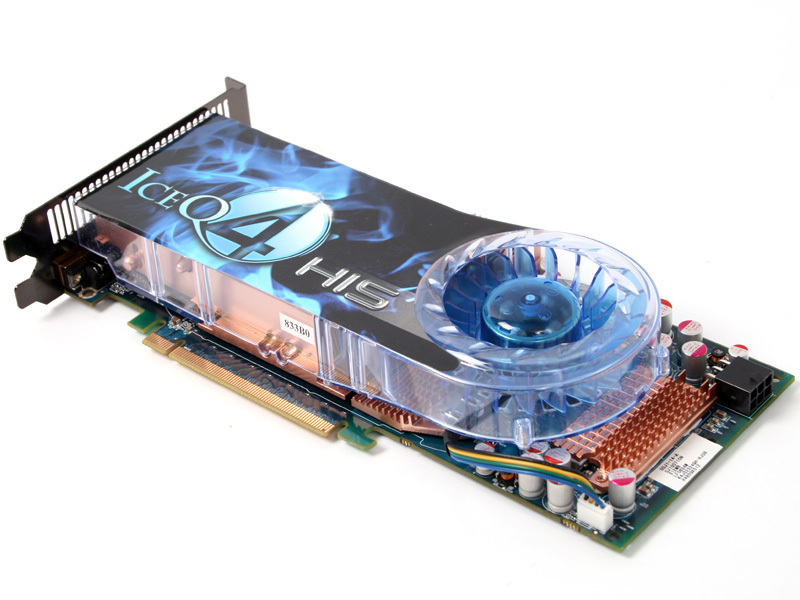 The Radeon HD 4850 is arguably the best bang for buck graphics card on the market at the moment and it has been a favourite in the bit-tech offices ever since its release. The cheaper models are currently sitting just over the £100 mark, with some sub-£100 deals if you're prepared to look around. 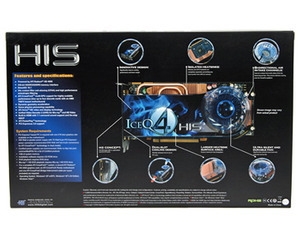 However, one thing that has concerned us—and many like-minded hardware enthusiasts—is the stock cooler's performance. Although the cooler is quiet, the GPU and memory end up running rather hot because there isn't a massive amount of airflow – we had recorded temperatures over 80°C when the stock-cooled card is idling on the Windows desktop. With that said, 80°C isn't hot enough to cause system instabilities, but it is a little warm for our liking. This can, of course, be fixed with a simple tweak to the default fan speed using either Catalyst Control Center profiles or a utility like RivaTuner (our favoured method), but that results in more noise. That presents problem number two – most enthusiasts care about noise these days, so any increase in noise is generally a last resort. Many would prefer to look for a third-party cooler that will enable them to overclock while keeping noise down to a minimum. This is where board partners have carved themselves a niche in a crowded market – many now have own-design Radeon HD 4850s and 4870s with custom cooling solutions and factory overclocks. One AMD board partner that has been doing this for a long time is HIS, famed for its IceQ series of graphics cards fitted with custom coolers. Today, we've got the company's latest addition to its IceQ range, the Radeon HD 4850 IceQ 4 TurboX 512MB. It sports a fairly decent overclock on both the core and memory—the former increased from 625MHz to 685MHz (a 9.6 percent increase) and the latter pushed up by 10.8 percent from 1,986MHz to 2,200MHz. 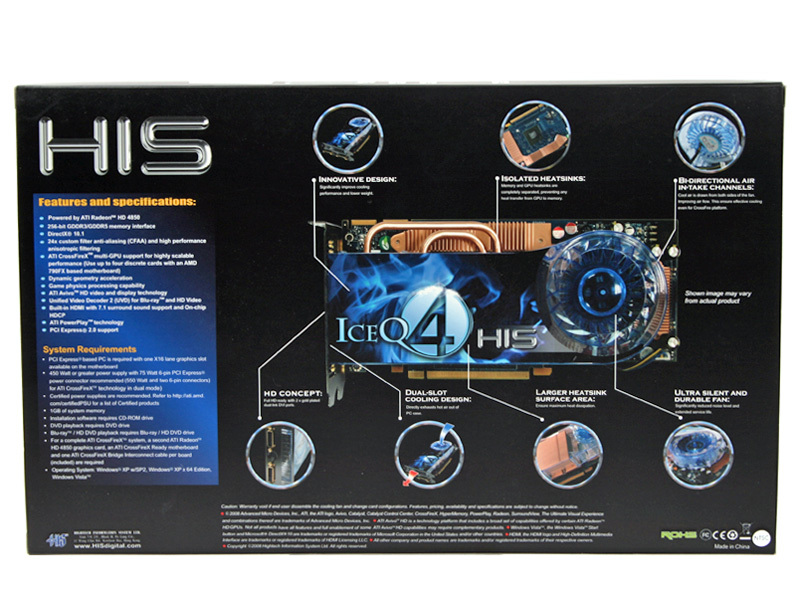 Aside from the healthy ten percent overclock, the biggest selling point for the card is of course the IceQ 4 cooling solution, which covers almost the whole card. It's a familiar design that works well and is inaudible above other system noise at both idle and load – it pulls air in through the radial fan and then spits it out the back after flowing over an array of aluminium fins and copper heatpipes. 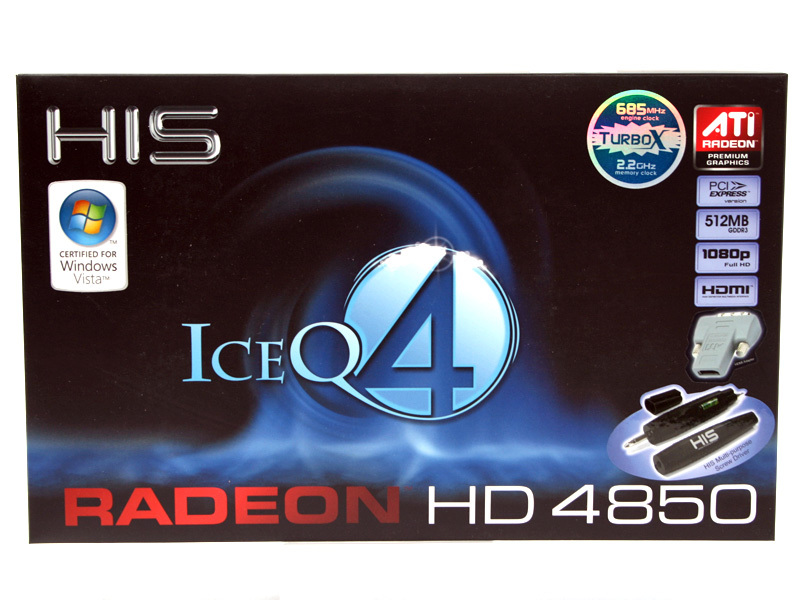 In terms of temperatures, the HIS Radeon HD 4850 IceQ 4 TurboX idles at around 49°C and the highest temperature we witnessed during our testing was about 63°C. At this temperature, the fan spun up from the default 40 percent to between 60 and 75 percent, but still remained quiet enough for it to not be noticed above other system noise because of its low pitch. 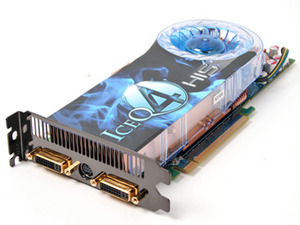 The differences between this version and the older model featured on the HIS Radeon HD 3850 IceQ 3 TurboX is that there's an additional heatpipe and an increased surface area for the fins the two heatpipes transfer heat to. HIS has dyed the board blue to fit in with the rest of the card's aesthetics. It fits in really well with the UV-reactive heatsink shroud, boltgun metal PCI bracket and twin gold-plated DVI connectors. The two black and gold DVI connectors are joined by a standard HDTV out connector—also in black—that sits in between the two digital connections. The bundle is unsurprisingly lacklustre, but everything you'll need to get the card running is included. 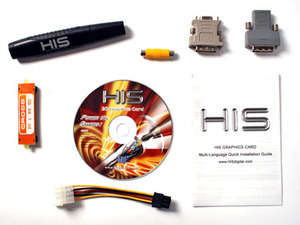 There's a DVI-to-HDMI dongle, a DVI-to-VGA converter, a six-pin PCI-Express supplementary power adapter, a TV-out to composite adapter and a CrossFire connector. In addition, HIS includes a driver/utility CD, a paper manual and an integrated screwdriver/spirit level. Aside from the screwdriver—which is a bit of a novel inclusion—it's clear that HIS prefers to spend more on spicing up the card itself than it does on the bundle. That's the way we like to see it. HIS offers a three year limited warranty on all of its products that covers parts and labour. During the first year, this warranty is held with the retailer where you purchased the card and the remaining two years are handled by the manufacturer. One thing that is definitely noteworthy is the fact that the warranty doesn’t start when you purchase the card, instead it starts from the day when the card was manufactured – that’s not ideal if the card is going to sit in a warehouse for six months. Despite that though, a good thing with HIS’s warranty terms is that you’re able to transfer this warranty should you choose to sell the card at a later date – this should sweeten the deal a little bit even if you’re put off by when the warranty term starts. 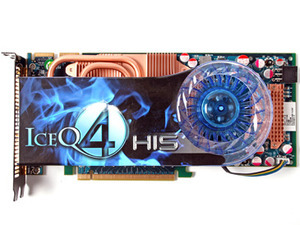 Passively cooling a Radeon HD 4850 is no mean feat and that's exactly what Gigabyte has done with the GV-R485MC-1GH graphics card. We have a look at the card and subject it to the Crysis Crunch to find out if the Multi-Core cooling solution is up to the task. Last week AMD announced the Radeon HD 4830 under a bit of a cloud after cards shipped out with an incorrect number of shaders enabled. We have a look at the HIS Radeon HD 4830, which happens to be the cheapest card in the UK, to find out how it compares to the fierce competition out there. Palit took the AMD ATI Radeon HD 4850 reference design and threw it out of the window before it started working on the Radeon HD 4850 Sonic. We check out Palit's completely redesigned card to see if it can stand up against the fierce competition on the market.